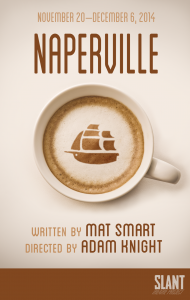 the off-Broadway show NAPERVILLE by Mat Smart; directed by Adam Knight! Brett will be playing T.C., the manager of Caribou Coffee. To play Nov 20-Dec 6 at the June Havoc Theater. Here’s how to get tickets.